Calling all old-school wrestling fans! Grab your tag team partner and enter the ring for Old School Wrestling Night at Busch Stadium on Tuesday, September 12th! 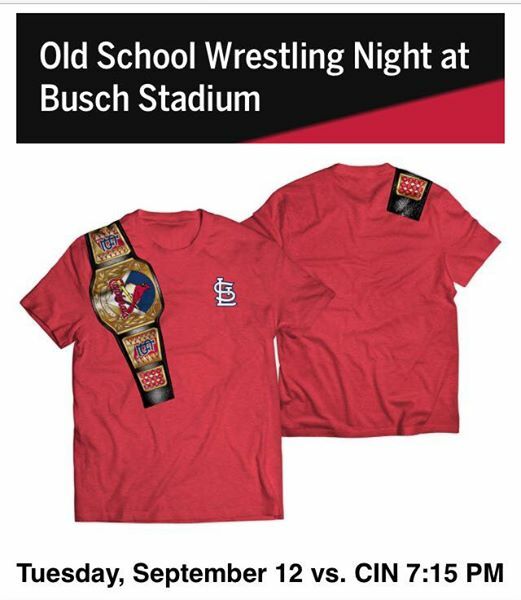 Fans who purchase a special Theme Ticket will take home a specially designed Cardinals World Championship Belt T-shirt by Dartallion Allen Jr. . Come early for a pre-game autograph session and meet & greet featuring old-school legends “Hacksaw” Jim Duggan, Ricky “The Dragon” Steamboat, and Road Warrior Animal! Please note: The Wrestling Night t-shirt is available only with the purchase of a special Theme Ticket. All Theme Ticket purchases for events that include giveaway items will come with a game ticket and a separate voucher. The voucher can be redeemed at the game or pre-game festival for that event’s giveaway item. You will not be able to receive the item unless you have your voucher with you at the event. You may pick up your t-shirt at Riverview Corner, on the terrace level across from Section 430, from 5:45 to 8:00 p.m. This entry was posted on September 10, 2017 at 11:52 am	and is filed under Uncategorized. You can follow any responses to this entry through the RSS 2.0 feed. You can leave a response, or trackback from your own site.